The U.S. Air Force Heritage Flight (HF) program presents the evolution of USAF air power by flying today’s state-of-the-art fighter aircraft in close formation with vintage fighter aircraft. 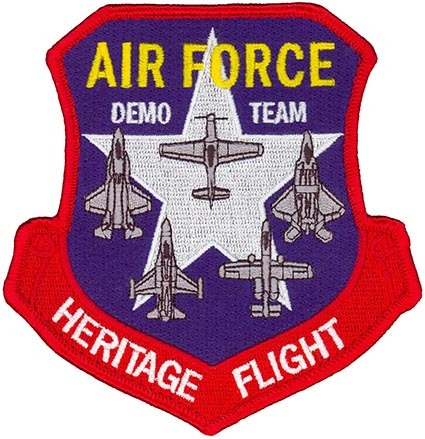 An HF performance involves a current USAF fighter piloted by an Air Combat Command trained military HF pilot and flown with a historical warbird piloted by a trained and certified civilian HF pilot. The HF formations of modern fighters flying with World War II, Korean, and Vietnam era fighters such as the P-51 Mustang and F-86 Sabre, dramatically display our U.S. Air Force air power history and proudly support our Air Force’s recruiting and retention efforts. In 2010, the Air Force Heritage Flight Foundation (AFHFF) was formed to keep this popular program flying.